2019 is the 25th Year of Garden Tours in Hermann! We are Planning Super Special Events including The Garden Party and Auction on May 31st and the Town and Country Garden Tour on June 1st & 2nd. Join us! More details soon on Events & Press Kit pages. Lots of Pictures on Garden Photos page. Every year the Hermann Garden Club sponsors garden tours, an annuals and hanging basket plant sale, an auction and other activities to raise money for scholarships and beautification projects in Hermann, Missouri. Please see our Events page to help you plan your visit. Won't you join us for one or more of our special events? Our Garden Tours are always the first full weekend in June. 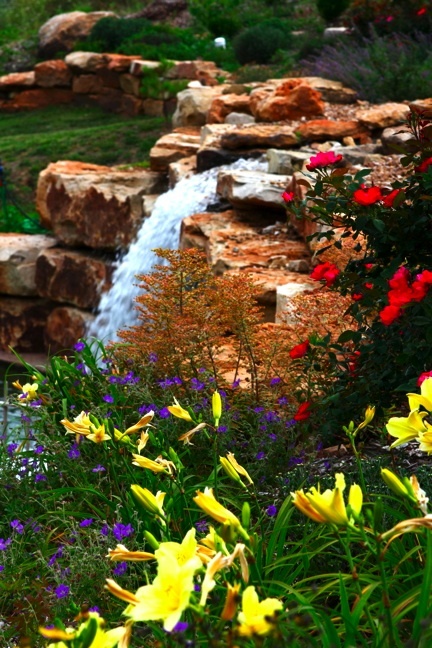 You can visit the Garden Photos page to see many of our beautiful Hermann gardens. Visit our Facebook page for more pictures of our gardens and all the wonderful auction items. Do consider joining us for the Luncheon/Auction in 2018. It is moving to Saturday.